The new generation of Heidolph Hei-VAP series of rotary evaporators, now available from John Morris Scientific , gently and efficiently remove solvents from samples by using evaporative systems and are ideal for ecology, chemical, pharmaceutical, food and oil industries. The Hei-VAP series contains three models of rotary evaporator - the Value, the Advantage and the Precision models. The Value model is an affordable model with a hand lift for all standard applications. It features two large dial controls for adjusting rotation speed and heating bath temperature. 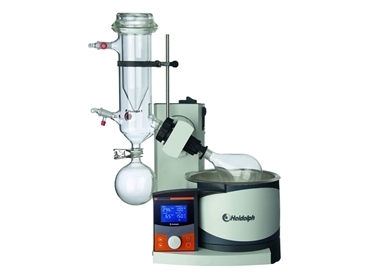 The Value rotary evaporator is simple to use and ideal for use in universities. The Advantage model is idea for routine distillation applications and reproducible results. It features an automatic process timer, which will turn off the evaporator at a pre-programmed time and remove the evaporating flask from the bath on motor lift models. The Advantage rotary evaporator has a large 3.5" LCD display, easily read at a distance, which indicates rotation speed, heating bath temperature and vapour temperature. And finally, the Precision model is suitable for the most demanding applications and fine integrated vacuum control capabilities. Configuration of the unit is not necessary as the evaporator recognizes all connected components and peripheral devices. The Precision rotary evaporator has a 4.3" graphic display, again, easily read at a distance, which features all parameters, integrated vacuum controller, and includes programs or automated distillations. long life seal – the one seal used in these rotary evaporators has a typical lifetime of 3-5 years even when used in the most corrosive environments.